Hi and welcome to the Cheap Sheds G56 1.76 meter by 2.1-meter assembly video. We will be showing you all the steps involved in putting together your shed plus giving you some useful tips and advice you may want to use. Firstly Please ensure you wear safety glasses and gloves at all times during assembly. Saftey always comes first so it’s important to cover up and protect your hands and eyes. Start by opening the box and taking out your hardware kit. Your hardware kit includes the instructions manual, so cut that free from the plastic package. This video has been recorded to assist your instructions, so it's highly recommended you keep your manual close by. Great, you can no start unpacking. Put your channels aside as you’re taking them out of the packaging. Refer to the ‘parts list’ section of your instructions manual and start taking the panels out. Sorting your panels at this stage will make the process easier and faster. We’ll start with building the rear panel. Start with a D wall corner panel and 4 (pieces of) C wall panels … place them on your workbench, the colour side facing up. When joining the panels, remember that the large rib goes over the small rib. Once you have the 5 panels all lined up, you can secure them together with the supplied self-tapping screws. A tip to start with is to avoid excessive tightening; driving the screw too far creates a depression in the metal. Moving on to our assembly, add the M channels to the top and bottom of the panels. Then place the channel on, make sure the cutout section is facing down. You can start with temporarily securing one corner. You don’t have to drive this corner screw in all the way as this is only to hold the structure for now, you’ll undo this later when you’re putting the walls together. Your assembly instructions may suggest not adding the corner screws, as later you’ll have to undo them, however, we do add them as we find it is easier to move the panels around this way. Then secure the channel to the second rib before you can go to the other end. Then drive in the screws at all ribs along the channel. Repeat the process on the other side of your rear wall. This completes your rear wall, you will need another person to help put this aside for now. You’re ready to start on your front wall. You’ll need 2 D panels for the front wall. Then component Q, your doorjambs will go along panels D on both sides. Then you secure the bottom and top M channels on starting from the inside. Then the same process on the other side of the front panel. Then the exact same process on the top channel. Next you will need component R and S, your bottom and top door spacers. Drive the screws in along channel R and then S which is the top spacer. Place the S channel on the top and drive in the screws along the way. Once you’ve done that, turn your front panel around and drive in the screws on the other side and that completes your front panel. Now you’re ready to move onto your side gable wall panels. As always, refer to your assembly manual. Line up panels A1 to A6- remember, the large ribs overlap the small ribs. Join the panels together in the middle, then secure the N channels to the bottom of your side panels. Next step is to add “O” and “P” gable tops. Drive the screws in along the channels. At this point of time, you are ready to fix the ridge beam bracket. The easiest way to get the brackets up is to only drive the first screw in half way … and that leaves the beam bracket loose enough for you to be able to pull it right to the other hole and drive the second screw in. Now you can tighten the first one. Okay, its time to turn your gable wall on its side to screw the beam bracket to the wall sheets. You can pre-drill the 4 holes or you can drive in a screw from the inside out - so the beam bracket stays in place. After this step, lay the sidewall down again and drive the screw in just enough to see it popping out on the top, then use the mark to drive the screw in from the top. Next turn your first screw around and finish off the remaining two screws with the same technique. That completes your first gable sidewall. The process is exactly the same on the other gable sidewall, this time using panels B1 to B6. There is one more thing we need to do before we can start joining the walls together, that is to assemble the ridge beam. This is pretty easy, look out for the pre-punched roof holes and make sure they are on the same side when you place the beams together, and then simply drive in the screws along both sides. At this point we have all the wall panels ready, so we can join them together. Make sure you build your shed on a level surface, we are using a YardSaver Flooring kit that we can also supply you as an optional extra. Joining the walls is best done by two people. One person can hold the walls while the other can drive in the screws. Place the side panel beside the rear wall and undo the corner screws if you added them before. Drive in a screw midway along the corner. Secure the top together … then the bottom with the corner brackets as you can see on the screen. Repeat the process at every corner, and then you’ll have the 4 walls joined together. Finally, you are ready to fix the ridge beam. Drive in the screws on one side while make sure you have helper holding the other side of the ridge beam in place. Then drive in the screws on the other side. If you purchased the optional 3-tier shelving and tool hanging racks, this is a good time to add them to your prefered spot. 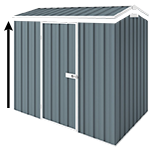 We are ready to start adding the roof panels, which are marked with E.
Once again, it is very important for any building to be level and your brand new Cheap Shed is no exception. At this point double check to ensure your frame is level so all your holes line up nicely and you can simply attach the roof panels. Starting with the first panel, make sure the large rib is facing out and start adding them from the door side. Due to our site, the back access was blocked, so we had to start on the rear wall but we recommend you start at the door. Please make sure you use the supplied plastic washers for your roof panels as they will ensure your shed is 100% waterproof. Add your sheets one after another until you get to the last one. We suggest you finish your door side before you move onto the rear side. Fix the first two sheets on the back, then place the first ridge cap, but don’t screw it in yet! Fix the next two sheets then fit the second ridge cap and then screw both the first and the second ridge cap down. Keep repeating these steps until you finish the roof panels. Next step is to remove the topside wall channel screws and attach the trim ‘W’ and screw it back on. Roof trim “V” goes along the front and back. Then the corner caps. Your roof is now complete. PART 7- Assembling your Door panels. It is time to assemble our door panels. Again take a good look at your assembly instructions before you begin this stage. Its best to get it right the first time. As you will see you will need 2 F panels for the door, each alongside the “G” door centre panel. These panels are perforated and the ends need to be snipped off. Then drive in a screw in both panels using a clip nut from your hardware pack. Now use your H channels for the top and bottom of your door to secure the panels together. Make sure the small lip of the channel is facing the top, which is the front of the door. Next secure your ‘I’ channels alongside the doors. Then fix the ‘J’ door boxing to the left and right using 6 screws each side to complete the door frame. On your second door, the door seal, which is marked with and ‘L’ will go in between channel ‘I’ which is already secured to the ‘J’ door boxing. Now turn your doors around and drive in the screws on the back of the door as well. Once you secured all 6 screws along each side, you will need to add the door bracings -marked with a ‘K’. The easiest way to secure the braces is to drill from the back first, so you’ll see where the screws need to go from the front. Once you finished with the braces, you will need to add the hinges. Simply secure them to the pre-punched holes. As easy as that! Next, we’ll add the doorplate. Make sure it is square and use a clip nut for the screw that goes through the sheet. Voile! You door is complete and ready to be hung. Place one screw on the top and one on the bottom to hold the door in place. Then add the second screw to the top and bottom -and your door is up! Next step is to mark the location of your catcher, pre-drill the holes and drive in the screws to hold it in place. Next, use the provided anchors to anchor the shed to the ground. Secure the corner brackets to the base, use a screw if you are using a plywood base like we did, or the supplied masonry anchors if you are building your shed on a concrete slab. Then add the 4 angle brackets, your assembly instructions will show you exactly where. Pre-drill the holes, then go outside the shed and place the screws in the pre-drilled holes. Once done you can go back inside and place the angle bracket on the bolts and add the nuts. Now add a screw, if you are using a flooring kit like we did, or the supplied masonry Dyna-bolt if you are building on a concrete slab. Add the other 3 angle brackets and you are done anchoring your shed. Congratualtions your Cheap Shed G56 is now complete! You can now move onto fitting any accessories you purchased to improve the organisation of yoru shed or start moving your things in to their new home! Thank you for watching this video and feel free to contact us with any questions.